Image: Barcroft Media/GC Images, Gotham/GC Images/Getty Images. Design: Allison Kahler/StyleCaster. But how did Kourtney Kardashian, Kim Kardashian West, Rob Kardashian, Kylie Jenner and Khloé Kardashian come up with their one-of-a-kind baby names in the first place? Well, like many things that confuse us about the Kardashian-Jenners, there’s a story behind everything. 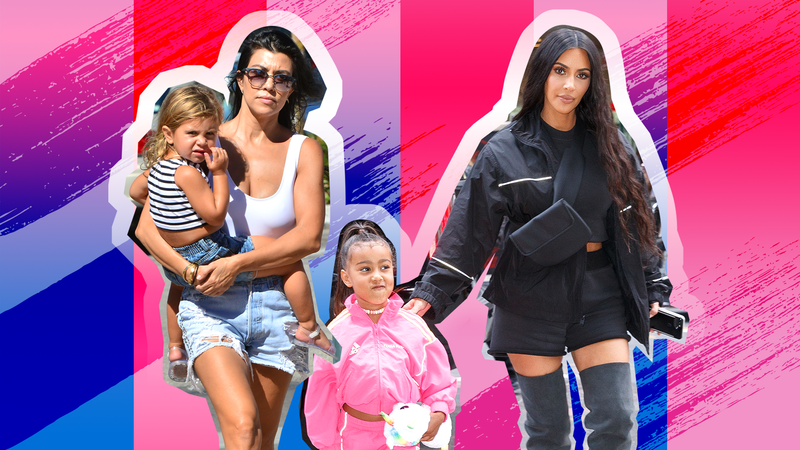 From the way the Kardashian-Jenner sisters nod to their baby daddies to the puns they created with the father’s last names (looking at you, North), the tales behind these titles are almost as interesting as the family themselves. Find out the meanings behind each of the Kardashian-Jenner baby names ahead. Though it was rumored that True’s name was a dis of Khloé Kardashian’s boyfriend and baby daddy, Tristan Thompson (who reportedly cheated on her weeks before True’s birth), the name is actually the name of True’s great-great-grandfather, True Otis Houghton. In an Instagram, True’s grandmother, Kris Jenner, revealed that her grandfather on her dad’s side was named True, which is where Khloé got the name from. (Fun fact: Kris’ father’s middle name was also True, so it runs in the family.) “My Grandfather’s name on my Dad’s side was True Otis Houghton….my Dad’s name was Robert True Houghton…so i am so excited Khloe named her daughter True!! !” Kris wrote on Instagram. Of all the Kardashian-Jenner babies, Stormi might have the most unique name, but she also has the most mundane story behind it. For the Evening Standard‘s May cover, Kim Kardashian West interviewed Kylie Jenner about the origin of Stormi, which came from a simple conversation between Kylie and her boyfriend (Stormi’s dad), Travis Scott. “I really don’t know how we thought of Storm. Her dad insisted it was him, but I feel like it was me. And that kind of just stuck with us,” Kylie said. For die-hard Kanye West fans, the meaning behind Chicago’s name is simple: It’s where he grew up. Though West was born in Atlanta, he was raised in the South Side of Chicago, so it makes sense that his third child’s name was a nod to where he grew up. Many fans also believe that Chicago is a tribute to West’s mother, Donda, who raised him in the Windy City and died in 2007. It’s no secret that Kim Kardashian West went through the ringer when she was pregnant with her second child, Saint. (She documented several miscarriage scares on her show, Keeping Up with the Kardashians.) So, naturally, she and Kanye West would think of their son as a blessing. An E! News source claims the couple named their son Saint because they saw him as a blessing through Kardashian West’s difficult pregnancy. As for those who wondered why they didn’t name him South West, Kardashian West shot that option down in a 2015 interview with NPR. “I don’t like South West, though, because that’s like — you know, North will always be better,” she said. Though Reign’s dad, Scott Disick, calls himself Lord Disick, his mom, Kourtney Kardashian, takes full responsibility for coming up with the title. In an interview with People, Kourtney revealed that she had been thinking of the name since she was pregnant with her first child, Mason. The name came up again when Kourtney was pregnant with her second baby, Penelope, but at that time, she spelled it "Rain." When she was pregnant with her third child, she was sure that it would be a girl and decided from the beginning that Rain would be the name. But when her baby turned out to be a son, she changed the spelling to "Reign," which suits the family better. “Once I found out I was having a boy, we just changed the spelling again,” Kourtney said. As for Reign’s middle name, Kourtney wanted something that started with an A, so his initials would spell out R.A.D. North started out as a joke, but as time went on, Kim Kardashian West and Kanye West seriously considered it as the name of their first child. In an interview with Vanity Fair, Kardashian West revealed that Pharrell Williams initially asked the couple if they were going to name their child North. After Kardashian West shot the idea down, Anna Wintour later came to the couple with the same suggestion, which is when Kardashian West and West decided that North it was. “She told us, ‘North is a genius name.’ Kanye and I looked at one another and just laughed. I guess at that point it sort of stuck,” Kardashian West said. Like many baby names, Penelope was born because Kourtney Kardashian and Scott Disick thought the name was cute according to an E! News interview with Kris Jenner. As for Penelope’s middle name, Scotland, it was also a suggestion from Kris, who pitched it as a nod to Penelope’s dad’s first name, Scott. As for his middle name, Dash, it’s simply a nod to Kourtney’s last name, Kardashian, and the nickname that her dad, Robert Kardashian, was called. “Dash is short for Kardashian, and it was my father’s nickname,” she said.